The 120-square-meter Caretaker’s House is constructed from a variety of unseasoned timber, including larch, cedar, and spruce, but uses the wood for more than just its framework. The wood is also used for heating and insulation, particularly on the relatively closed north side, which features thick and heavy timber walls. In contrast, the south side opens up to the outdoors with a large verandah that extends the living space into the wooded landscape. Large windows bring natural light indoors and frame views into the forest. Passive solar orientation minimizes the home’s energy needs. “The construction process is super-efficient,” write the architects. “There are no wet trades whatsoever – the mini piles are steel and the only non timber structural item.” The interior light timber walls are left untreated and contrast beautifully with the black steel window frames, doorways, and wood-burning stove. In addition to the locally felled timber, the house was also constructed using joinery manufactured on-site and steel bent piping welded on-site. 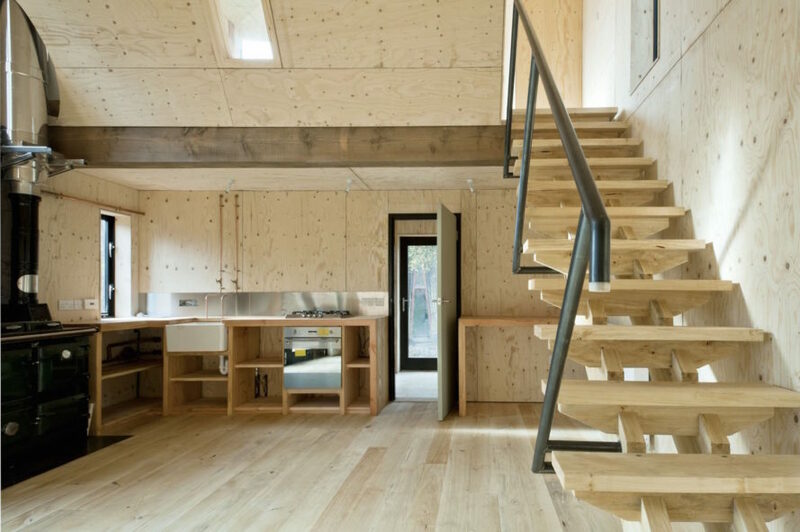 The 120-square-meter Caretaker’s House is constructed from a variety of unseasoned timber, including larch, cedar, and spruce, but uses the wood for more than just its framework. The wood is also used for heating and insulation, particularly on the relatively closed north side, which features thick and heavy timber walls. In contrast, the south side opens up to the outdoors with a large verandah that extends the living space into the wooded landscape. Large windows bring natural light indoors and frame views into the forest. Passive solar orientation minimizes the home’s energy needs to meet Passivhaus standards. The interior light timber walls are left untreated and contrast beautifully with the black steel window frames, doorways, and wood-burning stove. 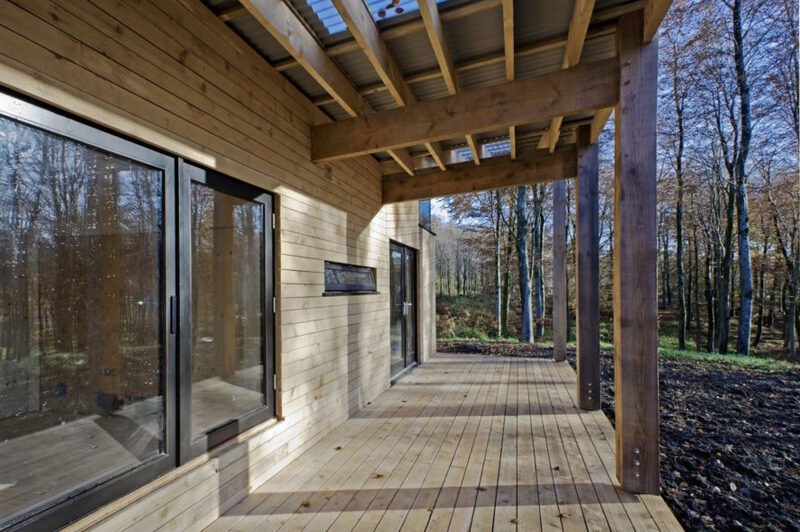 In addition to the locally felled timber, the house was also constructed using joinery manufactured on-site and steel bent piping welded on-site.